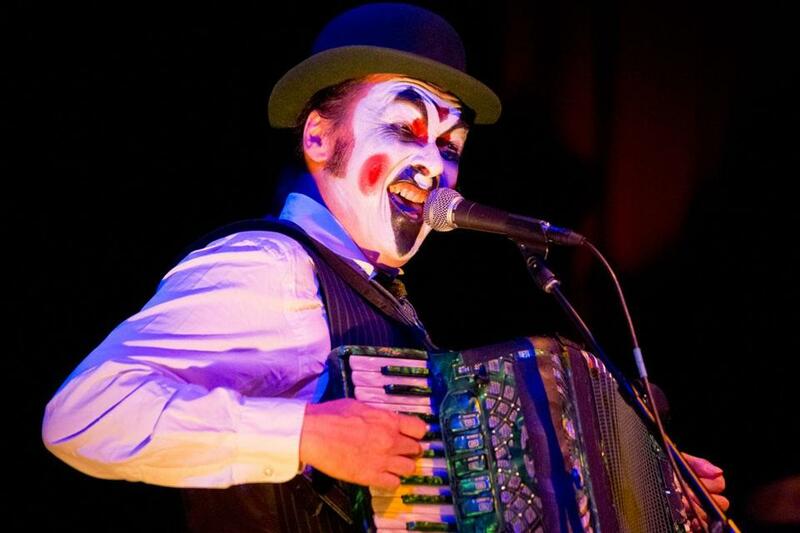 Tiger Lillies singer-songwriter Martyn Jacques at Oberon on Monday. The focus of these events is singer-songwriter Martyn Jacques, who performs, outfitted in bowler derby, his face swathed in grease paint. Singing alternately in a high countertenor or a deep Tom Waits growl, he’s a combination of Mack the Knife and a Pagliacci from hell. Yes, it was eerie, sinister, funny, and at times a bit oppressive (a lot of slow tempos). Jacques sang most songs accompanying himself on an accordion or upright piano, with Adrian Stout on bass and Theremin (and one impressive outing with saw) and Mike Pickering on drums (in one song the sound of sticks on cymbals mimicked a blade being whetted). They played waltzes, polkas, blues, a tango, a rumba. Jacques was a virtuoso at spitting rhythmic syllables and holding pitch in that uncanny upper register, at times singing quite beautifully. Until the end of the show, though, he spoke only to announce the intermission, this too in a falsetto. It was something of a relief, then, after nearly two hours, to hear him during the encores joke with his bandmates and the audience. His breaking character came as a kind of relief, and a gift.